SuperPro have developed a rear differential mounting kit for the Evolution X that helps control excessive rear axle movement. This leads to greater stability and contact between the wheels and the road for improved power delivery. The kit fit all engine variants and models and is a direct replacement for the OEM parts. The high power & torque characteristics of the EVO 10 put extra load on the rear differential, loads that the original rubber mounts can struggle to cope with. The result is twisting of the diff, pinion movement under load and axle tramp. Replacing the rubber original mounts whether new or worn with the SuperPro polyurethane mounts will reduce the ability of the transmission to move under load thereby improving power delivery and traction. 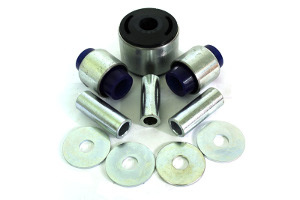 The design of the mounts coupled with the SuperPro material make them suitable for road use on standard cars as well as appropriate for modified, track & motorsport use. Part number SPF3730K includes all three mounts as pictured and is available with a list price of £115.65 +VAT. We offer MLR special discount on all SuperPro bush fitting.